Green 19" L x 14" W Comfort Grip Tray | U.S. Plastic Corp. The Comfort Grip series fast food trays are designed for quick service restaurants, cafeterias, food courts, schools and healthcare operators. Comfort Grip trays are manufactured from plastic resin that meets FDA standards. We use only the highest quality materials and never substitute to reduce costs. Trays are durable, light weight, and do not contain BPA's. They are impervious to food acids and are self-healing when scratched. 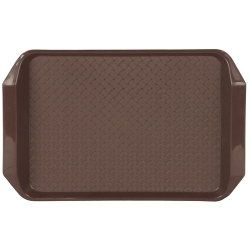 Comfort Grip trays are manufactured utilizing a special molding process that makes them less prone to distortions; therefore, they remain flatter than other competitor's trays. 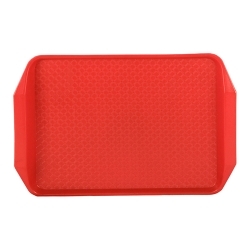 The feature that separates the Comfort Grip tray from the traditional tray are the large, easy to grip handles located at the ends of the tray. These handles allow for a firm, steady grip. The tip of the handle rolls down to keep your fingers from slipping. This will help you to reduce messy spills. Dishwasher safe. They have an attractive and practical basket weave surface that will not split or fray. 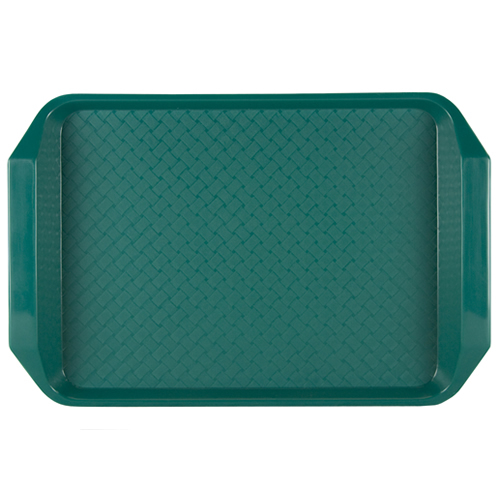 Additionally, Comfort Grip style trays feature sanitary stacking lugs for faster, bacteria free drying. Made in the USA.